The Catholic Truth Society boasts that the translation they include in their booklet of the Ordinary of the Mass is a newly commissioned one. This is a good thing, for many translations in old hand missals are not very good - surprisingly enough, from the era when a good number of Catholics would have had the Latin to notice errors and infelicities, at least so one would imagine. There are certain words and passages which can serve as a litmus test of liturgical translations. Does it translate 'hostia' as 'host', or 'sacrifice', or correctly, as 'victim'? Does it refer to Abraham as a Father or Patriarch, as the Latin does, or find some mealy-mouthed substitute? Does it cut out the poetic adjectives which adorn the Institution Narrative: accipiens et hunc praeclarem calicem in sanctas ac venerabiles manus suas? It is at a slightly more subtle level that the CTS translation is deficient: and I am afraid the deficiency is a real one. It is evident to me, not a great Latinist by any means, but, like many Catholics, someone who can look from the Latin page to the English one and see what is being translated, that the translation is just consistently, well, a bit lame. How do you translate that amazing word, tabernaculum? It was 'tabernacles' which St Peter proposed to build on the mountain of the transfiguration, and translators have rendered it as 'booths' and 'tents', but clearly this is a word freighted with significance. It is tabernacles which feature in the Feast of Tabernacles: 'Feast of Tents' hardly captures the idea. And the word and the concept have been adopted for the dwelling of Our Lord in the Blessed Sacrament in our churches. It appears in the Psalm Judica: 'unto thy Holy Mountain and unto thy Tabernacles'. The CTS gives 'tents'. Lame. The LMS has 'tabernacles'. What of the Canon? Prayer for the living: pro se suisque omnibus: literally, 'for them and for all their own', the LMS conveys the sense with 'for themselves and all who are dear to them'; the CTS has 'for themselves, for their families and friends'. As well as suggesting that the Latin says things it simply does not say, don't you think this lacks dignity? It is lame. What of the 'locum refrigerii', which we pray for, for the dead? The LMS captures the idea, born in hot countries no doubt, of the cool and quiet of heaven, with 'place of refreshment'. The CTS has 'a place of respite.' Seriously lame. How about 'Hanc igitur oblationem'? The LMS gives us 'this oblation'; the CTS 'this offering'. Now that is really lame. An oblation is more than just an offering. It always reminds of me of Martin Luther saying that the Canon 'stinks of oblation'. Well, the CTS version doesn't: at least, not so powerfully. The fact is that the Latin is flowery. If you don't like it, find some other religion: these are among the most ancient liturgical texts which exist in the Church. It is flowery, repetitive, poetic, and larded with foreign, exotic, and archaic vocabulary (by the standards of its own day). It needs to be translated in a way which is faithful to these realities. That is why the LMS has used 'thee' and 'thou', which the CTS has not had the courage to embrace, which are rather less archaic to us than 'quaesumus' was to Romans in the 4th century. Translating is difficult, and I don't want to be too harsh on the anonymous translator who struggled over these texts for the CTS. I am sure he was poorly paid. But readers of this blog can do better. They can buy themselves the LMS booklet. It can be purchased from the LMS website. Typo in your transcription of the institution narrative: accusative singular of calix = calicem, rather than calicum. At the urging of Fr Hunwicke on his blog, I've been reading Prof Mohrmann on liturgical Latin. She's very clear that these ancient prayers were composed in a deliberately hieratic language that was far distant from ordinary speech. It is flowery, as you appositely suggested! Thanks for the correction, I've corrected the post. Mohrmann is great: a must-read on liturgical Latin. While I wholeheartedly agree that there are better and worse ways to translate, with the better preserving a hieratic character and leaving allusions identifiable, I'm afraid you pass too far in regiones gustuum by labelling "sacrifice" as an outright "incorrect" translation of hostia. Within the canon "victim" certainly seems more appropriate, but "sacrifice" is a dictionary meaning that is intimately bound up with the notion of victimhood and at various scriptural places was chosen by DR/Challoner (e.g. Heb 13:15; Ps 115:8) as the better rendering, upon which I agree. Why nitpick this issue, a "test" passed by the CTS translation? Not to cast aspersions upon the other judgment calls made in your post, but to urge caution against pressing a case too far without first having . . . made a case. It is not enough to assert that something sounds lame. In most cases we are not dealing with inaccuracies so much as accurate but insufficiently rich/sacred/allusive translations of the liturgical text. In order to show superiority, therefore, one ought to explain what is lost by an alternative translation. This brings me to the one point on which I think you've overextended yourself here: tabernacula. Our modern English "tabernacle" for the place of reservation certainly hearkens back to the OT dwelling, but that place of reservation is not, in fact, what is indicated by the tabnernacula of the Psalm. So one could easily argue that the drift of modern scriptural translations forces one to make a choice between the word that will sound most sacred (tabernacles) and the one that will convey the full OT context of the word. With both NAB and RSVCE translating "tabernacle" in Ex 25:9 but "tent of meeting" in Ex 33:7 and "feast of booths" in Dt 16:16, I am confident that most American Catholics who have not already familiarized themselves with traditional translations will fail to recognize the location of nomadic residence of God's Shekinah or the annual remembrance of His accompaniment in "tabernacle." "Tents" still sounds lame, but given the right audience it may nonetheless unpack the meaning better. Joseph I am saddened and surprised that you have chosen to attack CTS in this Blog. CTS is an organisation that works tirelessly to produce good quality booklets Missals etc for Catholic worship and information and it should be praised for bringing out a Translation of the Traditional Mass rather than having this form of nit picking criticism. If there are mistakes in the booklet then surely the right thing is to write to CTS helpfully pointing out unintentional errors and offering LMS help to get the second edition correct. Attacking CTS publicly way will not encourage them to produce other works about the traditional Mass and that leaves all Catholic poorer. Also I am afraid I do have to disagree with your comparison of the LMS Booklet and the CTS Booklet. In my view the CTS translation is much better especially for people who are used to the Ordinary Form and who may be new or occasional attenders at the Traditional Mass. The main reason why the CTS Booklet is preferable is that the translation is virtually the same as the new Translation of the Ordinary Form, the main differences arise because the CTS booklet was brought out before the new OF translation was finalised. For newcomers who are used to the OF having a translation with which they are already familiar helps them to understand and appreciate both the similarities and the differences between the OF and EF. In my view LMS missed a real opportunity to help newcomers to the Traditional Latin Mass when they brought out a their Booklet, Why, for example “In the name of the Father, and of the Son and of the Holy Ghost” rather than “of the Holy Spirit”. The word “Ghost” in English now has a limited meaning and so “Holy Spirit” is a much better translation of “Spiritus Sancti” than “Holy Ghost”. Why “And with thy spirit” rather than “and with your spirit” I am sorry but it looks pretentious. The Mass is going to be in Latin not English so why not use the words of the existing translation. Similarly in the “Credo” there are a number of pointless differences to the Creed as said in the OF even though the Latin in both forms is identical. I have tried the private route in correcting errors in CTS publications and this has not been well received. For a defence of the use of archaic language in worship look no further than the Ordinariate Use, or indeed the Latin of the Mass itself, as I point out. The use of non-standard idiom is indeed demanded by Liturgian authenticam, which establishes the official principles for liturgical translations. My own experience with CTS has always been very positive Re the Ordinariate rite the relevant point is that it is taken from the Book of Common Prayer which is of course the essence of the Anglican Patrimony which the Ordinariate exists to preserve it is equivalent to our use of Latin. The new translation of the OF is in accordance with Liturgican Authenticam so therefore it should be the basis for a translation of the EF in order to help people used to the OF. As I've said the CTS booklet is much more helpful in that respect than the LMS booklet. 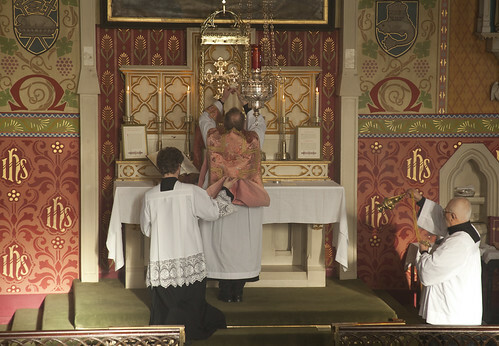 We are the Latin Mass Society not the 17th Century English Society.